If you are a Sydney train commuter you may now be able to get free Wifi whilst you are on platform waiting for your train. The other day I caught a train to Circular Quay and I noticed this sticker at ticket exit of the station. 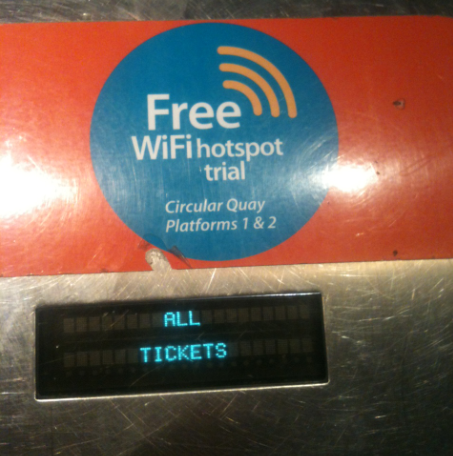 To my surprise you were able to get Free Wifi on the Circular Quay platform, and the speed was OK too. Now I have researched more into this and it seems free Wifi has been available for sometime – since mid 2011 ! Are you a CityRail commuter? Can you get free Wifi at any other train stations? and do you use the Wifi?